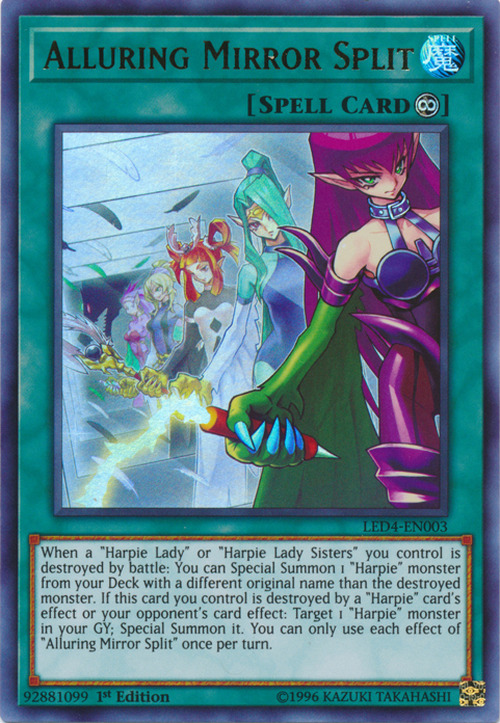 When a “Harpie Lady” or “Harpie Lady Sisters” you control is destroyed by battle: You can Special Summon 1 “Harpie” monster from your Deck with a different original name than the destoryed monster. If this card you control is destroyed by a "Harpie” card's effect or your opponent's card effect: Target 1 “Harpie” monster in your GY; Special Summon it. You can only use each effect of “Alluring Mirror Split” once per turn. The shadow of Harpie's Pet Dragon, Harpie Perfumer, Harpie Dancer, Harpie Channeler, Harpie Queen and Cyber Harpie Lady appear in this card's artwork.